Painting Easter eggs is a fun holiday tradition. Some families, however, use plastic eggs instead of the real thing. This does not mean you have to give up the painting tradition. There are many different ways that you can paint plastic Easter eggs to make them decorative or even look like the real thing. Egg painting can be a fun activity for both kids and adults, and you can mostly use whatever materials you already have in your home. Arrange your workspace. Choose a well-lit, open area with a flat surface to do your project. Lay down newspaper so that none of the paint that drips will ruin your table. Place your eggs, paints and brushes in an easily accessible location. Decide on your design. When doing this project with kids, let them pick their own designs. While some people like to give the egg a natural look, others embrace the ability to be unique and choose a wacky style. Open each egg that you are going to paint and set them out separate from each other. This will make the eggs easier to paint. Apply a base coat of paint that will give the egg a natural appearance. Choose a color for the egg and apply a coat of paint. You may have to apply a second coat after the first dries if the egg is not completely covered. Dip a sponge into an off-white or tan-colored paint. Let the excess paint dry off and dab the sponge onto the egg. 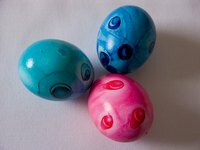 You will want the egg to be completely covered with spots of the paint you choose. Run the flat side of a brush along the surface of the egg. Do this before your off-colored paint dries. This will give the plastic egg the texture of a real one. Add any additional color or design that you would like. Make your egg creative and unique. Allow the paint to dry, and put the egg back together. Apply touch-ups, if necessary, to give the egg a finished look. Glitter can give your egg additional shine. Create a "nest" for your eggs with a decorative bowl. Children should be supervised while painting eggs.